At Engelman, our process is a little bit different than what you may have come to expect. Instead of choosing from pre-packaged and preset options, we present a nearly unlimited palate of options to truly make it your own. 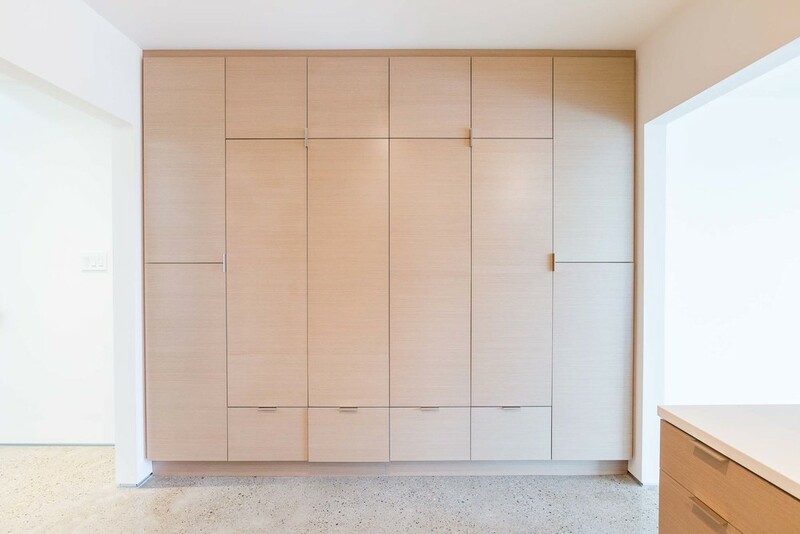 From our custom design process with our renowned modern design team, all the way down to trims, finishes, even the hardware on cabinetry, we strive to manage all of the little details, making a house Your Home. 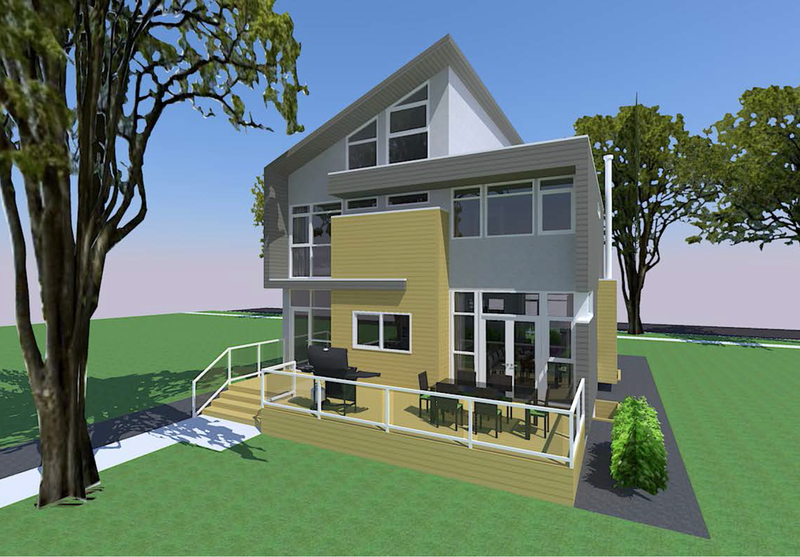 The E&H Concept was designed with two key elements, a love for clean modern lines, and natural wood textures. Walking up to the home there is a contrast between stark modern lines and warm natural wood which invites you in. Stepping through the private front entry you are immediately immersed in beautiful natural textures which bring both privacy and warmth to the front entry. A spacious flex room at the front of the home allows you the luxury of soaking in the ample natural light and street scape. 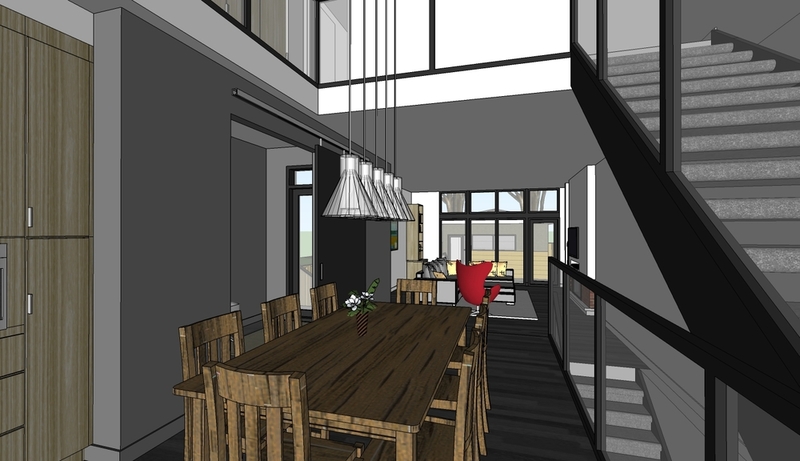 The large dining room allows for seating for twelve comfortably. The kitchen design allows for an island with seating for six, while accommodating a large work surface, sink, dishwasher, and a large under counter wine cooler. The large pantry and fridge allow for ample storage. The sunken living room features a ceiling which is open to above with wood accents, creating a towering space, which still makes one feel at home and comfortable. The two storey rear facing windows steam in massive amounts of sunlight to the living room directly, indirectly bathing the entire main floor with light. Moving to the second floor the master bedroom treats you to a built in bedroom suite, complete with natural grained wardrobe units throughout. The ensuite is complete with an independent makeup desk, water closet room, walk in shower, large soaker tub, and two sinks. Two large secondary bedrooms, a main bathroom, and laundry room round out the second floor. 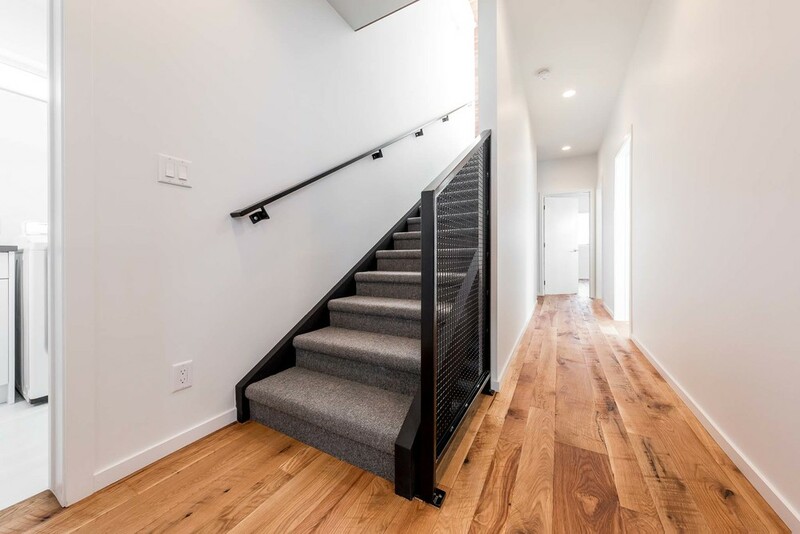 Walk up the stairs to the loft space and enjoy indoor/outdoor living between the roof deck and living room with wood burning fireplace. 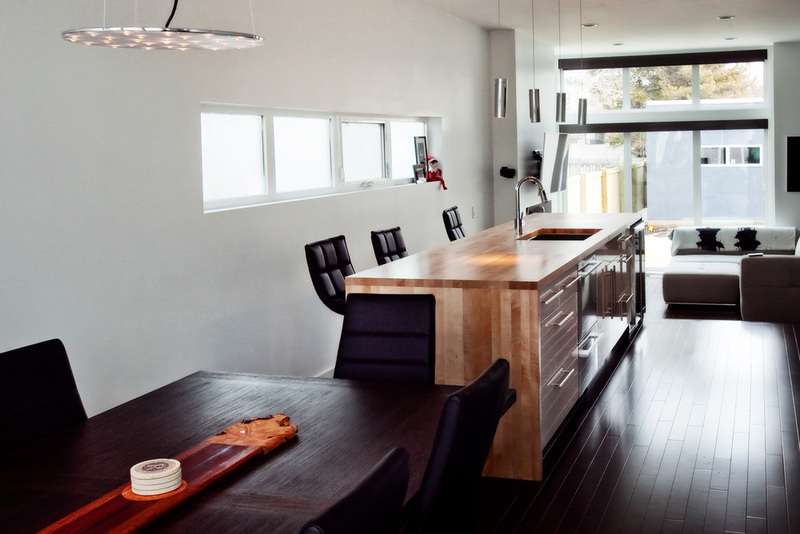 This is an elegant custom beautiful concept which balances stark modern design with warm inviting natural wood textures. Welcome to urban living at its best. 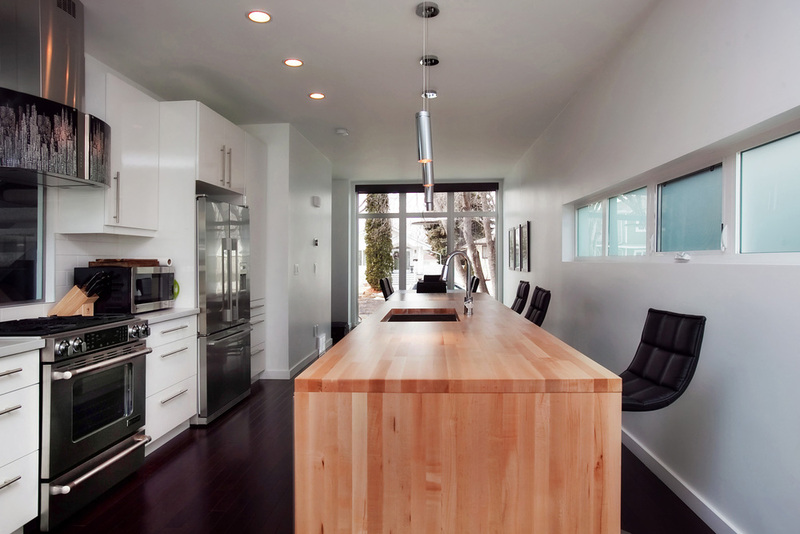 The E&C House is 1400 square feet of pure Modern Design. 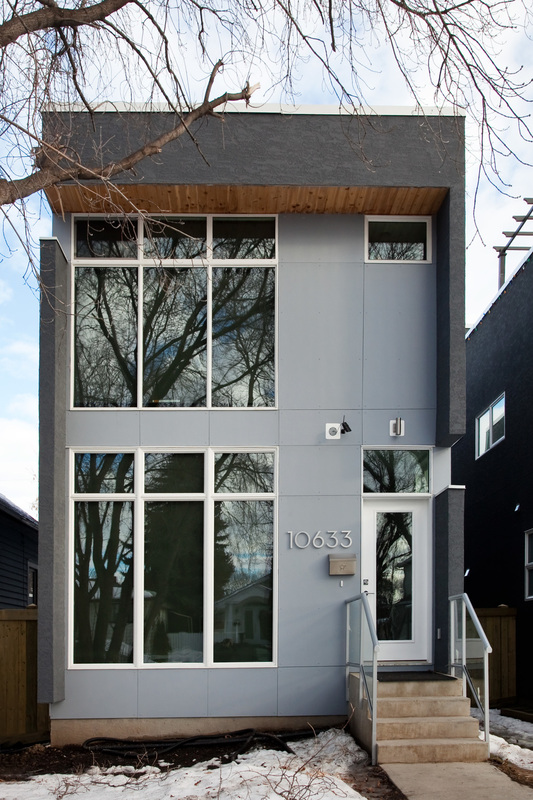 Designed to be a modern landmark in a legacy neighbourhood, this unmistakeable, head turning home catches the eye and draws you in right from the sidewalk. 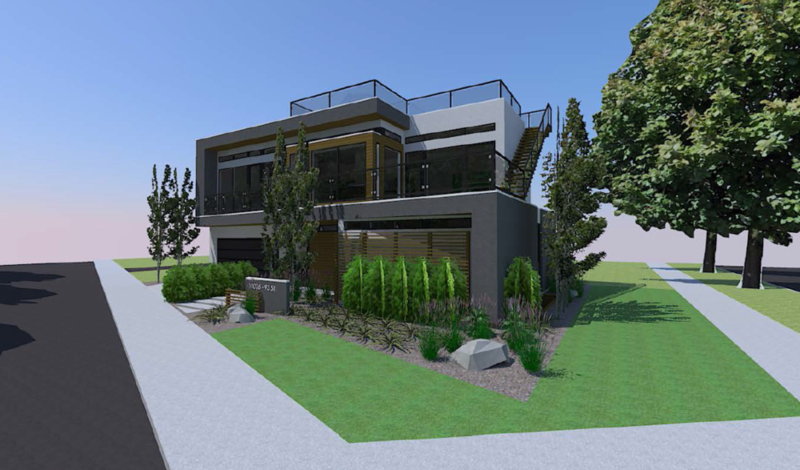 The modern design and clean lines are prevalent throughout the integrated landscaping as you approach the front entry on the tree lined street, bringing you through the front door and into the large, well lit front entry area. 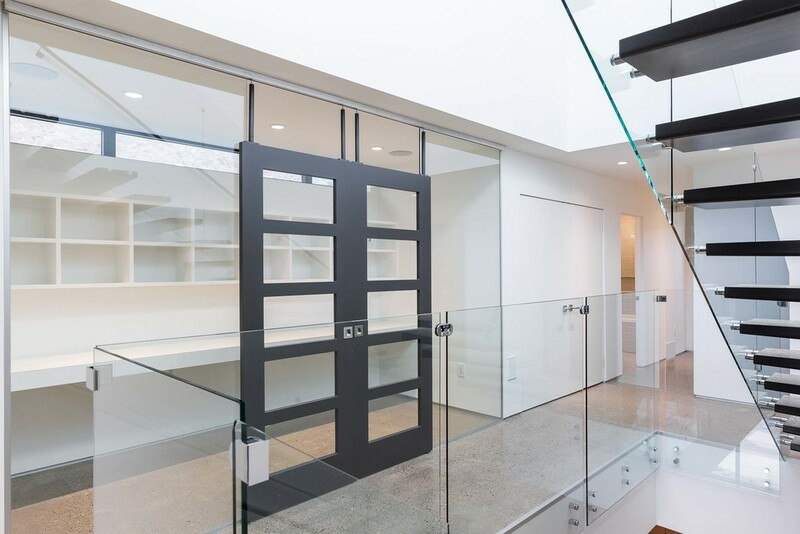 As you walk inside, you'll notice the spatial connection to outside areas remain - due to the extensive use of glass throughout the space. The open concept design allows for a clean and clear path through to the sunken living room, where you'll find integrated millwork to house the audio visual equipment, cleverly designed to accommodate the entertainment appliances without absorbing floor space. The modern gas fireplace beckons you to sit and enjoy the a timeless convenience while cozying up on the couch. Past the living room you'll find yourself standing in the truly modern kitchen, with granite counter tops and a custom island bar to accommodate a larger group, while offering a convenient place for additional built in storage. The natural gas range top, oven, and custom hood accent the modern glass finishes - giving this kitchen a truly clean and modern feel, while the large custom cabinets with built in under-cabinet lighting and wall mounted microwave provide plenty of function, without disturbing the clean lines. A cohesive flow from the kitchen to the dining area allows for entertaining guests easily with seating for 8-10 people - each having a fantastic view through the large windows. The main floor study offers a space to concentrate and have a dedicated space without being separated from the rest of the house in a different room. Complete with custom integrated desk space and shelving for a truly academic feel. 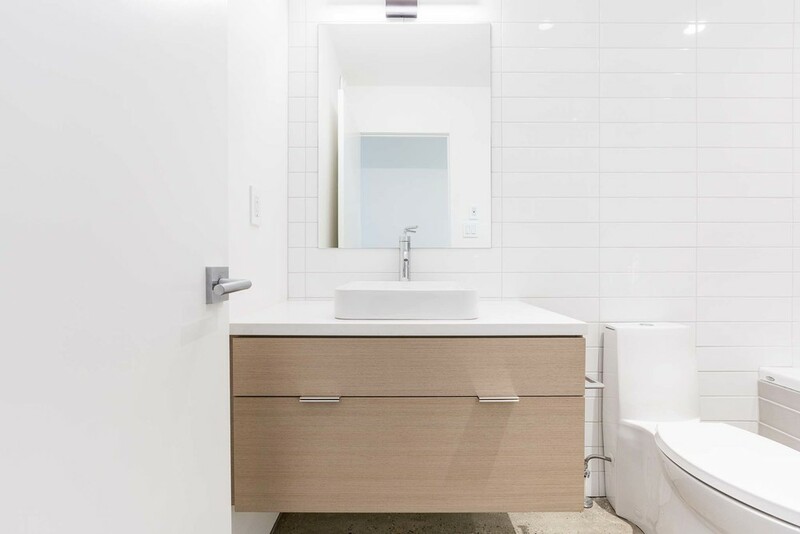 Upstairs, the bright and airy master bedroom has ample integrated storage, along with a sitting area , dressing area and a fully fixtured ensuite that boasts dual sinks, more integrated storage and a large, walk-in shower. The second and third guest bedrooms on the second floor are all large enough to accommodate a queen sized bed, and come complete with custom built in closet millwork. Second floor laundry, with folding and hanging space and the main bath along with a 6' soaker tub complete the second floor space - offering everything residents could possibly need. 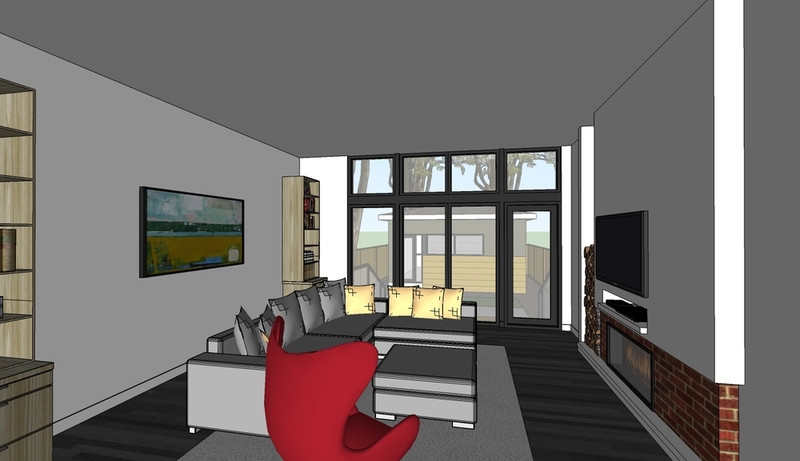 Downstairs, the 9' ceilings open up to a TV area with built in audio/visual equipment storage and media containment. The full bathroom and 4th bedroom, along with integrated storage millwork for seasonal items make this space feel more like a lower second floor than a basement. Outside, the patio is presented at ground level, allowing for a more private, intimate space to enjoy the modern exterior areas and spaces and natural gas BBQ. With a heavy focus on custom, modern design that delivers both exceptional style and a highly functional space, this residence is a project that we're extremely proud to attach our names to. Delivering striking clean lines greet you as soon as you turn the corner onto the street. 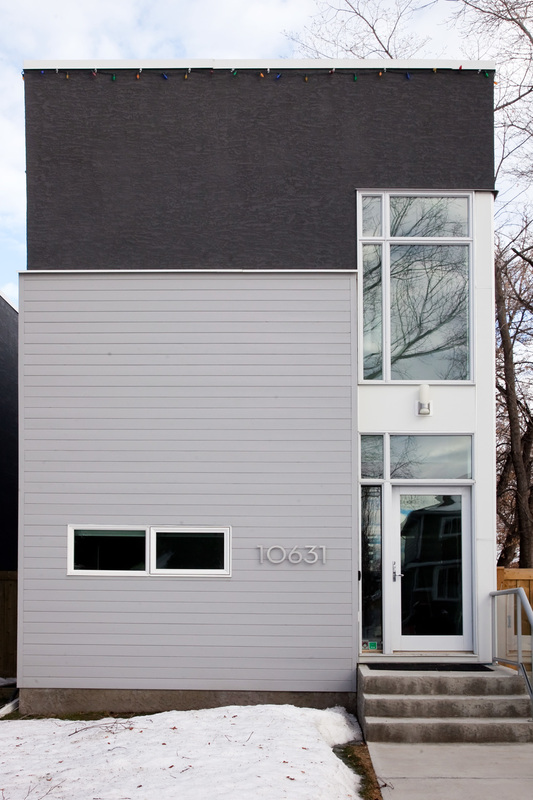 This home was designed to make a statement about urban living in Edmonton. Bigger isn't Better, Better is Better. The double volume front entry invites you in with an amazing amount of natural light. The open staircase allows light transference from front to back of house while sharp lines make it a modern fixture in the home. 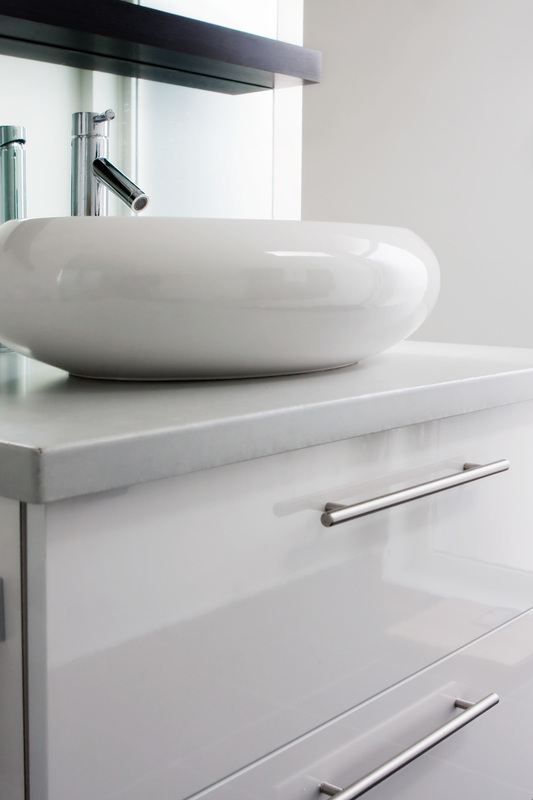 The concrete countertops compliment the beautiful grey laquered millwork throughout the home. Great sight lines through the main floor are accented by the spatially defining ceiling which breaks up the spaces of the main floor. A modern linear fireplace keeps you warm on those cool Edmonton winter days. The ample deck and backyard separate the house from the full sized double garage. The rear elevation is just as striking as the front, because why should you compromise on design where you spend your time? 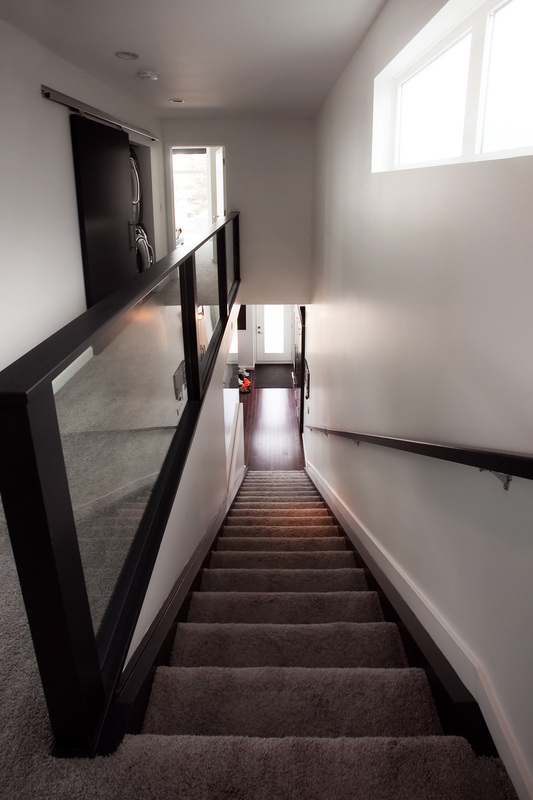 Walking up the stairs to the second level you are greeted by built in laundry on the bedroom level to avoid unnecessary trips up and down the stairs. The master bedroom features beautiful built in millwork units and floor to ceiling glass to welcome the sun in the morning. Two more ample bedrooms with built in millwork fill out the second floor before climbing the stairs to the full sized roof deck. With downtown views and a canopy of trees to keep you company, this is the place for urban living. The hot tub and four season all weather tv make this the place to enjoy your home and the beautiful surrounding area. The roof deck is fully outfitted with BBQ, sitting area, hot tub, patio heater, tv, and lounge chairs for enjoyment year round. This is truly modern, urban, living in a beautiful mature neighborhood. 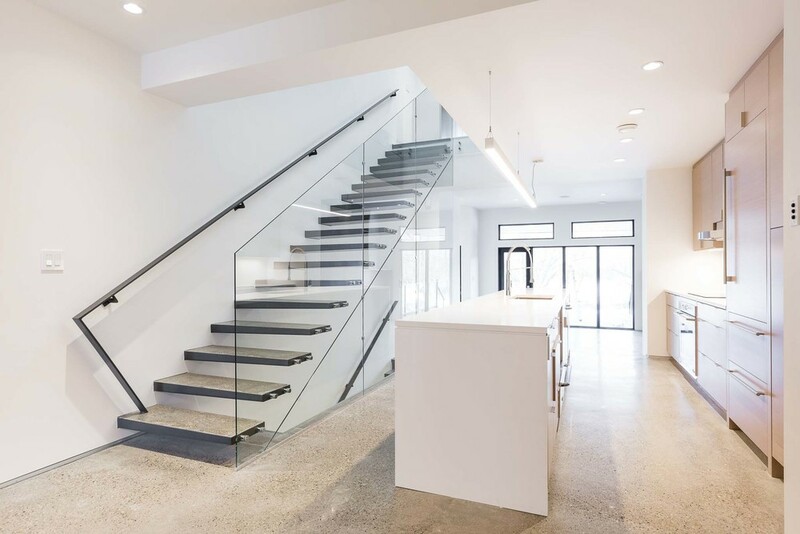 The 2,000 Squarefoot A&D House located in the highly desirable Sherbrooke community delivers clean, modern lines executed with warm, organic feeling materials. 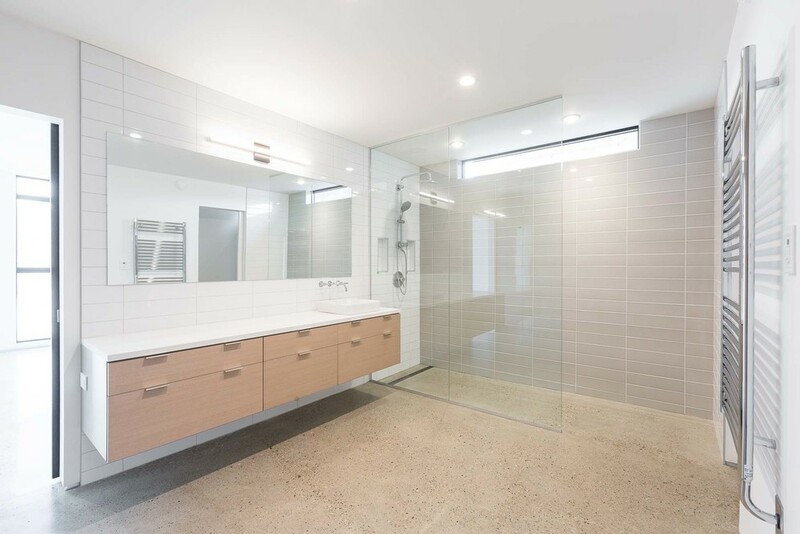 "Modern, not Minimal" was the mantra in this build, allowing us to work closely with the client to deliver a truly modern custom home without getting too far from a traditional material feel. Contrasting warm and cool elements - wood, brick, glass, and stone are present throughout the home - without becoming the centre piece of any given area. Refined, subtle fixtures and ample (but controlled) natural light sources are present throughout the open and clearly defined spaces, offering the ability for form to meet function in every area - keeping the overall feeling open, airy, and allowing for an eclectic mix of modern and traditional pieces to each have a place. 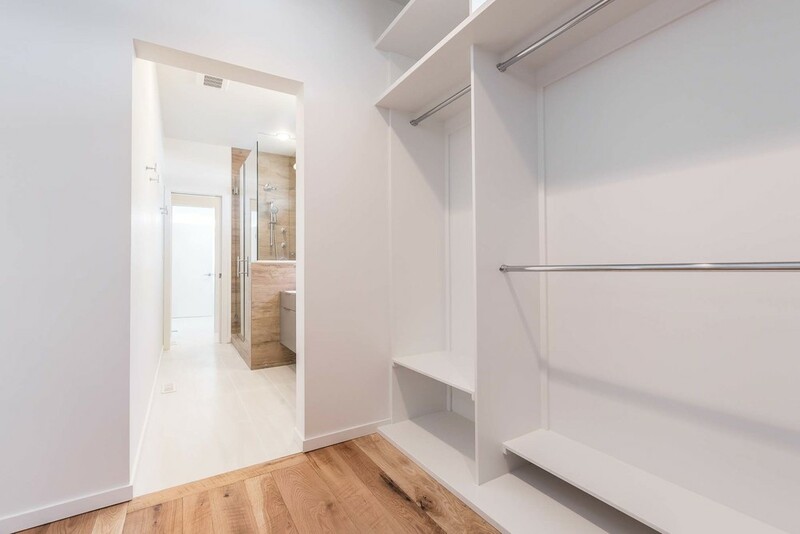 The well conceived flow of the seamlessly integrated spaces naturally guide you through the covered front entry area into a large, well defined bright foyer area - replete with custom integrated wardrobes for guest storage. Leaving the foyer and proceeding into the kitchen you'll notice the high end touches that are only found in a custom modern luxury cooking and entertaining area. The natural gas range is finished with a feature hood fan centred above the custom stone backsplash. The significant storage in the custom pantry and cupboard millwork (complete with under cabinet lighting) brilliantly frames the wall mounted microwave and additional wall mounted oven. A sizeable bar with optional island extension offers ample guest seating for casual events, and serves as a staging area with plenty of counter space to prepare for a formal dinner in the dining room - which has enough space to accommodate a table for 10 or more guests. Flowing out of the kitchen is the open and spacious living room complete with a gas fireplace and custom millwork that covers the A/V equipment when not in use. With an open and airy layout, there's always plenty of room for people and family pets to operate, even during times when there is a full house. Upstairs, an oversized master bedroom includes a his and hers walk in closets, complete with custom integrated millwork for storage, as well as a dressing and sitting area. The private, spacious ensuite opens to his and hers basin sinks, a 6' soaker tub and luxurious steam shower all resting on a rich, heated tile floor. 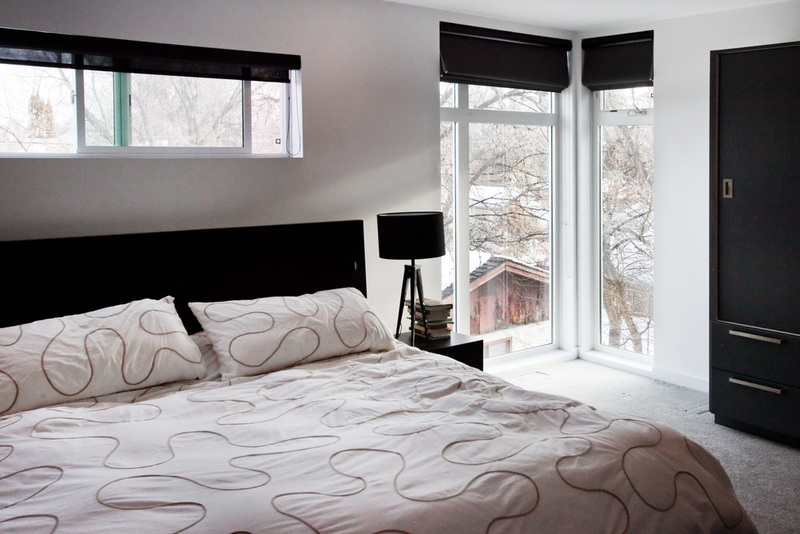 The second room upstairs is a study that will double as a guest bedroom - including lots of custom millwork for built in shelving, functional storage, and other space saving options like a murphy bed - ensuring that the most is made of the available space. Continuing upward takes you to the rooftop deck complete with a custom entertainment centre, a natural gas fireplace, BBQ and hot tub, along with plenty of room for entertaining guests - or - just sitting back and enjoying the view from the top. Downstairs the 9' ceilings make it hard to believe that you're in a basement. Past the wet-bar, full bathroom, and 3rd full size bedroom you'll find another area for entertaining - complete with custom millwork for the A/V equipment and built in display shelving. Scanning the room you'll notice the ability to walk right out of the basement to the sunken patio cleverly ensconced in it's own private courtyard - offering a calm and private respite available any time. 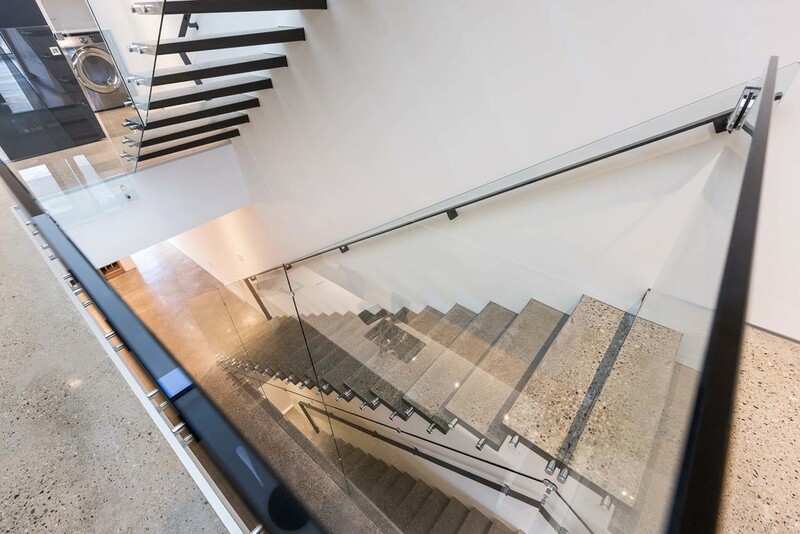 Keeping the mantra of "Modern, not Minimal" - and working very closely with our clients each step of the way, Engelman Construction has been able to do more than find just a house - we're happy to have been a part of helping our clients home. Delivering modern, clean lines and a well laid out space was top of mind in the development of The Day House. Our client wanted a unique combination of welcoming comfort and dramatic feel with the creation of their dream home - bright, open spaces that unfold before you, capturing the light and offering the utmost in modern design aesthetic. Working closely with our client, we were able to design and bring to life a property with a clean, modern flow that seamlessly blends the inside and outside spaces, making the entire property a singular, cohesive experience. 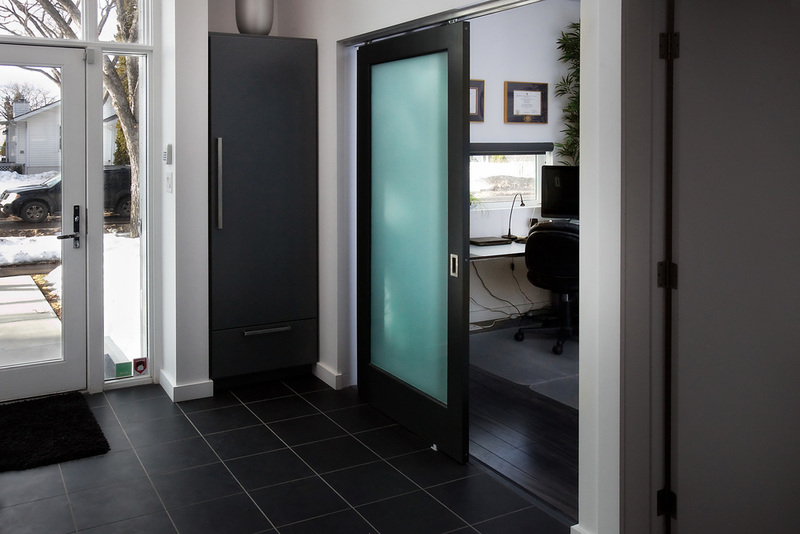 As you approach the front entry, you pass modern design elements with each and every step. An articulated front walk and custom built in planters guide you forward, welcoming you in and pleasing the eye. Dramatic built in lighting guides you in your journey at night, showing you a new view of this spectacular home. 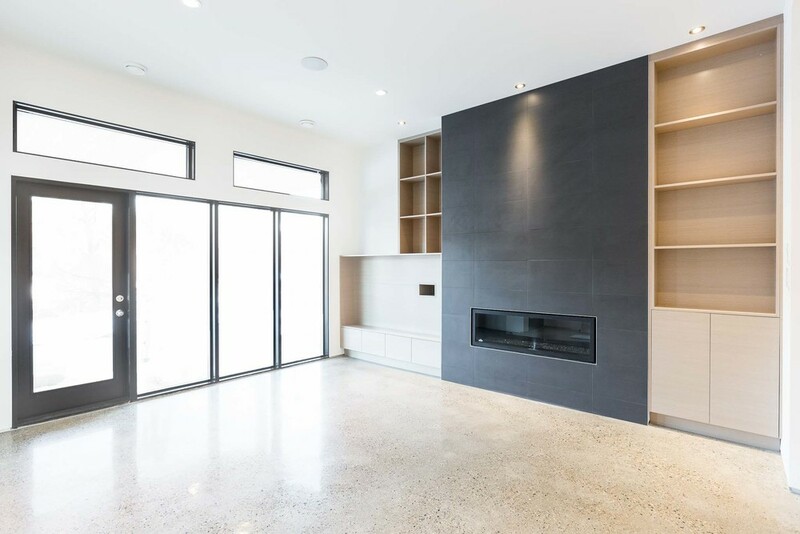 Walking inside the luxurious foyer, you will notice the polished concrete floors with hydronic radiant heating as you pass the built in entry-way wardrobes to immediately draw you in to the open plan. Great sight lines, ample natural light and clearly defined areas present no borders - giving you plenty of room to breathe. A decadently fixtured kitchen features a natural gas range, built in espresso maker, custom cabinetry with massive storage, under-cabinet lighting and significant counter space that allows for ample bar seating. The kitchen serves as a flexible and functional central space between the 10+ person dining room and the large, open, sunken living room - complete with built in cabinetry to house all of the Audio/Visual equipment and a natural gas fireplace. This open feeling flows all the way through to the covered ground level outside space with views of the River Valley forest. At night, dramatic lighting frames the garden offering the perfect backdrop for the landscaped grounds. Downstairs, the 9' ceilings deliver a cavernous, spacious feeling with an integrated media space, a guest suite, full bathroom and a flexible area perfect for children to play, or for enjoying the big game with friends. Upstairs, the large master bedroom provides a get away from the everyday - complete with a large walk-in closet, ample storage in the custom integrated millwork - which wrap through to the opulent ensuite bathroom with it's 6' stand-alone soaker tub and walk in shower. The design elements carry through to the rest of the second level with a guest suite, laundry area and the study - with built in book shelves, fireplace and and intimate seating area. The third floor leads to a roof top entertainment area with a hot tub, BBQ, 1/2 bath and eating area. The spacious and modern rooftop lounge area is perfect for entertaining intimate groups by the outdoor fireplace, taking in the night skies surrounded by the sights and sounds of the Edmonton River Valley, or simply listening to the calming sounds of the North Saskatchewan River. This truly custom build for our clients delivers a calm, comfortable modern design, and a flexible space to live, entertain, and enjoy the good life - showcasing what the Engelman experience can deliver. 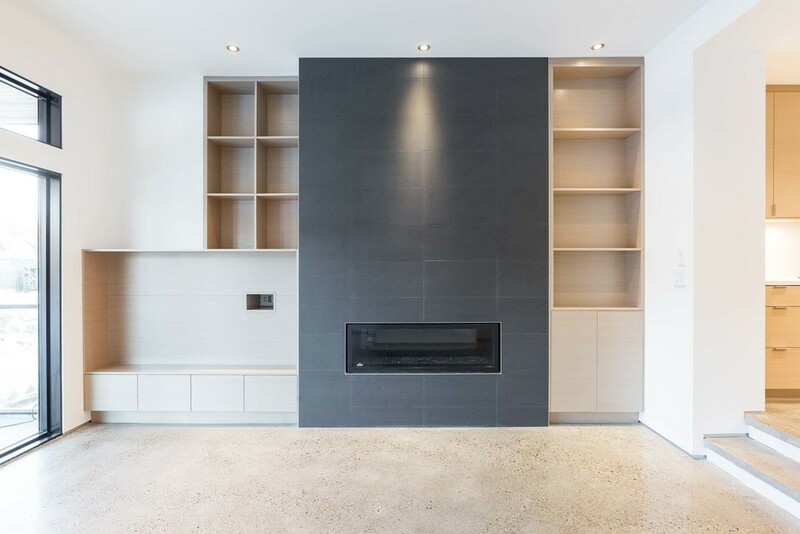 When designing the Hanson Semi-Detached project, we were able to leverage years of experience getting creative with smaller spaces - resulting in a semi-detached property that feels large, open and spacious. Approaching the home, you'll notice the unique architecturally focused landscaping, walkways, and built in area planters - all designed to draw the eye forward. Inside, you'll feel like you're walking into a grande foyer - full of natural light and complete with dark tile and bright wood floors. Clean, open sight lines open up the home before your eyes, while built in millwork for seating and storage welcomes you into the home. Crossing through the warm bright and open living room, you can't help but notice the centrally located fireplace, a great area to gather around with company or hunker down for a warm, relaxing evening in the winter. Moving through the dining area with seating for up to 8 people, you will enter the kitchen area. 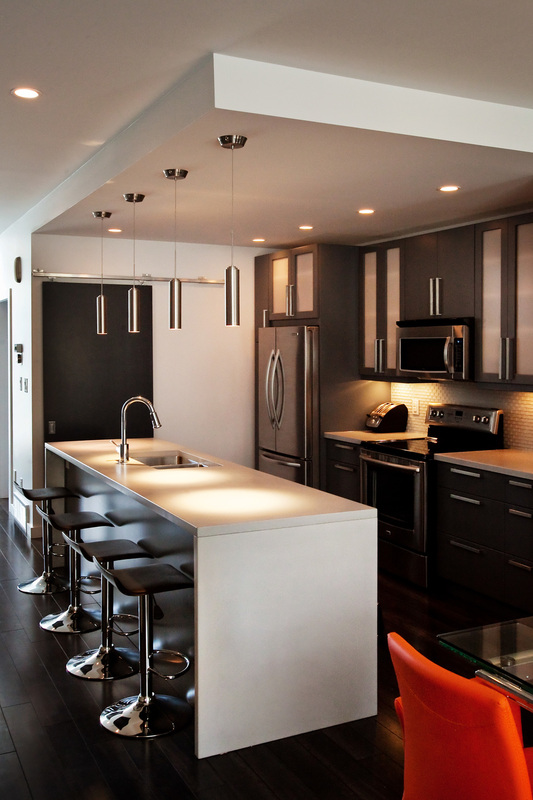 You will notice the layout designed with extremely careful attention to functional operation within the kitchen. An island with a built in sink anchors the space, and offers space for prep. The remainder of the kitchen - with wall mounted oven and gas range - is packed full of higher end touches, including a large primary sink, and custom millwork with under cabinet lighting. Upstairs, the large master bedroom accommodates a king-sized bed comfortably, and encourages functional use of the floor space with it's custom built in wardrobe units. Second floor laundry and 2 additional guest rooms - also with built-in custom millwork - round out the second floor, and lead you to the rooftop patio. Intended to be an additional entertainment area, the rooftop patio is ready for a hot tub and gas BBQ to be enjoyed while taking in the views. Downstairs, the 9' ceilings create the feeling of a larger space, while a wet bar, full bathroom complete with 6' soaker tub and shower, as well as 2 bedrooms with built in custom wardrobes make the space perfect for extended guests, or entertaining for an event. 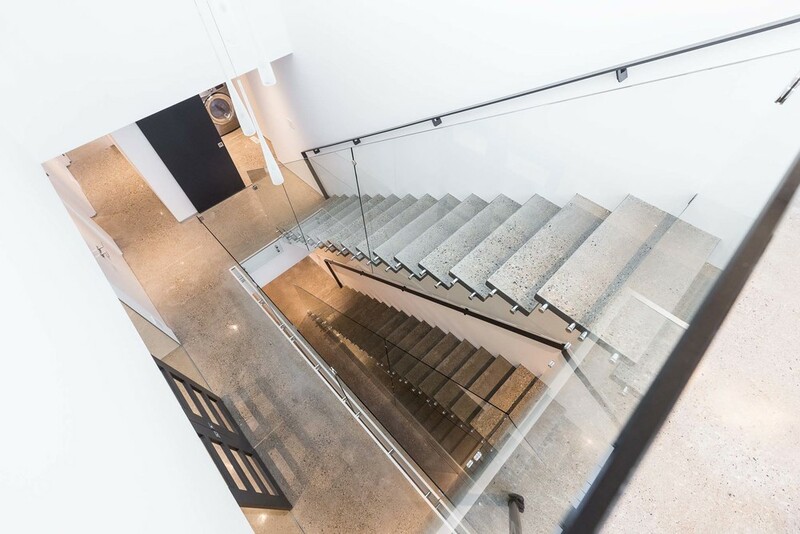 With the back stairs enabling access to and from the suite without moving through the main floors, there is an enormous amount of possible uses for this space - even as a potential income suite. This is a custom home that personifies the elegance existing in modern, sustainable design - catering to the lifestyle that our clients desire, at an attainable price point.